Our busy lifestyles leave us with little time to take care of ourselves and focus on what's really important. In an age of information overload it can be difficult to know what choices to make to achieve balance in our lives. In this superb book, Lisa Dawson (a qualified medical doctor, wife, mother and speaker) draws on years of practical research and experience to bring together the information we need to make healthy choices. 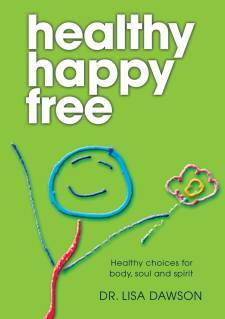 Healthy, Happy, Free in an easy-to-read guide that will serve you for the rest of your life. Healthy, Happy, Free covers nutrition, exercise, sleep, techniques for reducing stress, biblical principles for health, and the importance of a deep relationship with God. Give yourself and your loved-ones a lift - body, soul and spirit! Help: Click 'Add to Cart' to purchase. You can continuing browsing other Castle titles after adding this book to your cart. To view your cart click 'View Cart' in the top menu. Powered by PayPal (PayPal account not required for purchases). Copyright © 2009 Castle Publishing Ltd.